Prozac, Xanax, Halcion, Haldol, Lithium. These psychiatric drugs–and dozens of other short-term “solutions”–are being prescribed by doctors across the country as a quick antidote to depression, panic disorder, obsessive-compulsive disorder, and other psychiatric problems. But at what cost? 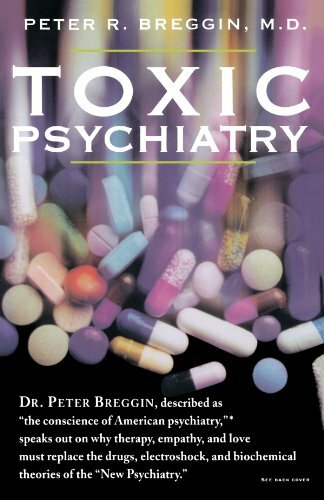 In this searing, myth-shattering exposé, psychiatrist Peter R. Breggin, M.D., breaks through the hype and false promises surrounding the “New Psychiatry” and shows how dangerous, even potentially brain-damaging, many of its drugs and treatments are. He asserts that: psychiatric drugs are spreading an epidemic of long-term brain damage; mental “illnesses” like schizophrenia, depression, and anxiety disorder have never been proven to be genetic or even physical in origin, but are under the jurisdiction of medical doctors; millions of schoolchildren, housewives, elderly people, and others are labeled with medical diagnoses and treated with authoritarian interventions, rather than being patiently listened to, understood, and helped. Toxic Psychiatry sounds a passionate, much-needed wake-up call for everyone who plays a part, active or passive, in America’s ever-increasing dependence on harmful psychiatric drugs.